Last week US President Donald Trump spoke about Jamal Khashoggi’s murder. On Tuesday, he issued a statement that was shocking to many people as he took office the side of the Saudi Arabian regime or rather Crown Prince Mohamed Bin Salman. The statement was shocking on many levels whether linguistically or politically but it started with the correct phrase “The World is very dangerous”, indeed it is. 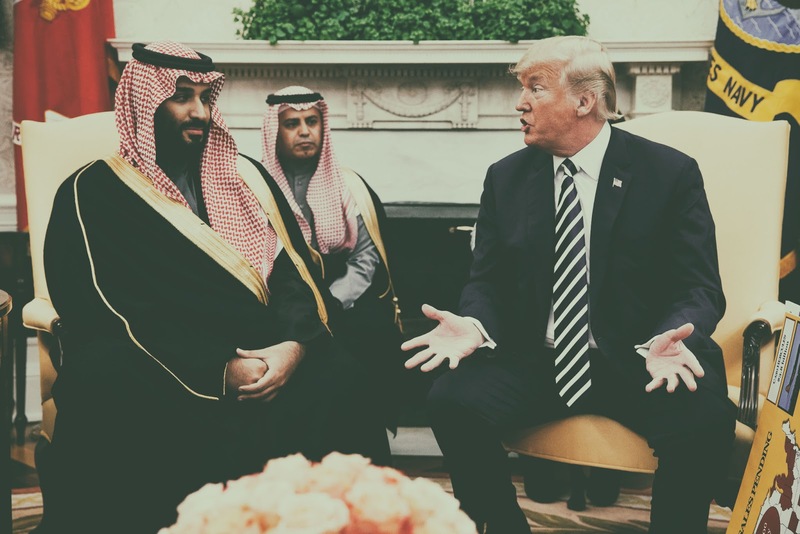 Trump and MBS in the White House in 2017 "AP"
And “Our intelligence agencies continue to assess all information, but it could very well be that the Crown Prince had knowledge of this tragic event – maybe he did and maybe he didn’t!” because screw logic !! Aside from the fact that’s one of the worst presidential statements I have read“I read and make news out of them and let alone from the White House”, there is a phrase I could not ignore. Seriously speaking if we use our brains in a logic, one must answer why Trump thinks that only MBS will serve the interests of the United States and Israel !! Then comes his media statements on Thanksgiving Day. In a press conference and a teleconference with the Military on Thursday, Trump was on fire for real. I believe as an Arabs we should be very thankful for President Trump’s honesty because after decades, there is a US president that was honest enough to tell the rest of the World the naked truth we all know about from very long time : All the West leaders care for really in the Middle East are Israeli Safety and the oil. They do not care about human rights, they do not care about democracy and that’s why they have been dealing with and welcoming the worst kind of dictators and strongmen in their countries. As long as those dictators will keep Israel safe and the prices of oil stable then there is nothing wrong in keeping them around especially that the public in the Arab world is supportive to the Palestinians and hate Israel. Even Israeli PM Benjamin Netanyahu admitted that during his speech in front of the Knesset during the 40th anniversary of Sadat’s historic visit to the Israeli parliament that the “Arab public opinion is the main obstacle for the normalization of relations between Israel and the Arab world unlike the Arab leaders”. The problem is in the Arab people themselves, not their unelected and undemocratic leaders. I do not need to say that that the most of the public in those countries are against that normalization and are in the support of a boycott to Israel and its apartheid occupation policies but they do not have a podium to express that freely except in the social media only. Ironically and logically, that continuing support to the Middle East strongmen because of Israel will create even more hatred to it among young Arabs. It is a fact that Arab people know that since the 1973 oil crisis, the United States and the West leaders had made sure that that the oil embargo would not be used as a weapon. We also believe as Arabs that King Faisal of Saudi Arabia paid the price of that daring move on the hands of his own nephew Faisal Bin Musaid. From 1973 oil embargo led by King Faisal to Israel would be in trouble without trouble without Saudi Arabia or rather its MBS crown prince, the Kingdom went too far. I feel angry on many levels but seriously I am thankful that Trump spoke about that elephant in the room without sugarcoating it.